I knew a secret and I kept my mouth shut. Moreover, everyone else had kept their mouth shut as well. I had not seen any public mention of the private unveiling of NemesisNXT at the Mojave, California, Airport on June 4th 2004 at 2 PM. But I knew it, Id received the assignment to go there for AAFO.COM, and now, I was there. I arrived in usual Bill Pearce style, confused but on time. I figured going to the white tent with all the people around it would be a safe bet. Sure enough, thats right where I wanted to be. Not one to confine myself, I decided to stand at the back where I would have a clear shot of the podium. Right at 2 PM, Patricia and Jon Sharp began their presentation. Jon started by thanking us all for being there today. As they introduced the NemesisNXT crew, Jon said he had to leave to "go get something". He said he "would be right back." Patricia stated that the design for the NemesisNXT, which stands for Neoteric eXperimental Technology, had originally been started as a Formula 1 racer but they had already done "that," so it quickly evolved into a Sport Class racer. The new design is made entirely from composite materials, with the exception of fiberglass used for the wing tips and part of the vertical stabilizer. The design went through extensive wind tunnel testing before the first mold was made. As Patricia began to explain what they have been doing for the past 4 years, the long wait for the moment we were about to experience became more understandable. For the construction of NemesisNXT, they decided to use an impregnated composite material that needed to be kept frozen until being formed. So they needed a freezer, a big freezer. Once formed, the material needed to be cured in an oven. So they needed an oven, a really big oven. Being Mojave, one might think they could have used any hanger for that purpose. Regardless, they acquired both a large freezer and oven. This left them in the position of being able handle the material, but it still needed to be molded and formed into the parts that make an airplane. Forty-seven molds were CNC machined from High Density Foam, and to comply with the Sport Division racing rules of five delivered kits, enough parts were made for those five kits. Construction on the prototype could now begin. Make no mistake, the Sharps are air racers. Building a prototype, while also building five additional kits would be hard enough, but the Sharps are also in business to make airplanes. Making their task even more difficult, they produced an instructional video while they assembled the prototype to ease the task for builders of their kits. With the long years of preparation almost behind them, it was now time for the moment weve all been waiting for, the unveiling, the birth of NemesisNXT. While Patricia Sharp led the assembled gaggle of photographers and assorted witnesses to the hangar we expected to find the new airplane housed in, I took delight in my snake-like, or maybe weasel-like ability to go from the back of the pack to the front. I was now in position, front and center before the closed hangar. Okay, you got us, good one, now make with the plane! Patricia led us all into the hangar. I maintained my front-of-the-pack status and was now standing before tables of refreshments. Then it happened. You know, that smart voice and not-so-smart voice you have in your head? Im talking about the smart one that says "This is NOT a good idea." Right before the not-so-smart one says "YEE HAW!!". Anyway, that smart voice was saying that something was not right; something did not add up. The not-so-smart voice said, "Dude, you be trippin. Were at the front of the pack, squished into a confined hangar with no way to get out but through all the people behind us. What could go wrong? Hey, have a brownie and some punch." I then heard a sound and consequently, that not-so-smart voice was silent for hours to follow. What I heard was NemesisNXT taxiing up in FRONT of the hangar. All those people that had been "behind" me now obscured my view and didnt I feel smart. They fooled me twice and this time, it was "shame on me". But I knew what I had to do! I began to push children and old ladies, onlookers, other photographers, everyone out of my way! The gathered mass of photographers dashed towards the plane as though it would only be there for 15 seconds, rather than a few hours. As I raced past the film photographers I told them that they needed to change to ISO 100 film due to the sun. Ha, that will slow them down. As I sliced through the digital photographers I reminded them to check their white balance. Ha, Im the man. this airplane is absolutely beautiful! I spent the next couple of hours circling NemesisNXT, taking photos and admiring the work. Stunning! I am unable to adequately describe the fit and finish of this aircraft. I will let the pictures speak for themselves. 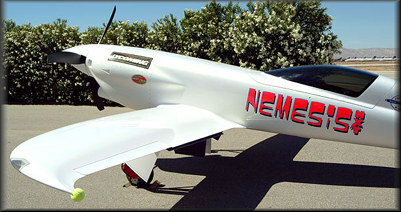 NemesisNXT is a 2-place, side-by-side, low wing tail dragger. It has retractable main wheels and a fixed, steerable tail wheel. It consists of molded carbon fiber Monocoque construction. NemesisNXT wing span is 24 feet, with an area totaling 70 sq. feet, its length is 23 feet. One document that I have lists the weight of the plane, while yet another says it is classified. So, for the time being I will just list the weight as "not much". The power for this sleek new design comes from a turbocharged six cylinder, air cooled Lycoming TIO-540-NXT engine, driving a specially designed 3-blade Hartzell Prop. As I stated above, the Sharps are in business to build airplanes, and their new design is a kit plane designed with "Perfect Fit Technology" built in to save the assembler time while they build their kit advertised as being "breathtakingly fast". Paying attention to the very last detail, they have provided a quality kit. Kits are available now for $129,500. As far as we know, the airplane has yet to make its first flight, so any speeds would be purely speculation, but if looks mean anything, as advertised, this airplane will be plenty fast! With all the media and interested parties in attendance, as you might expect, Jon and Patricia were pretty busy, but I did manage speak with both briefly. Jon said that NemesisNXTs attendance at this months Pylon Racing School at Reno would be a stretch, but not impossible. Only time will tell. The official public debut is set for AirVenture 2004 in Oshkosh, WI, at the end of July. As I left for home on the long drive from Mojave, I thought ahead to September and the National Championship Air Races at Reno. The fury and power of Unlimited Division will be as awesome as ever. But with the addition of the NemesisNXT, the Sport Class will never be the same. * All information contained in the article is to the best of my knowledge, correct. It was obtained "on the fly" and as such may contain unintentional errors. My sincerest apologies if it does.